I have an equipment question. Is there a mirror for seeing infront of my truck? I have an equipment question. Is there a mirror for seeing infront of my truck? I feel like thre are more compact cars and I can't see them so low I front of my truck? Thank you so much for asking your question about truck parts for your truck. You are a forward-thinking trucker who wants to avert an accident with a compact car. This is very important since it seems that in our day, more and more drivers of four-wheeled vehicle are becoming more daring in how close they can cut in front of trucks. (I call this the "video game mentality".) We know of one trucker who was cut off by a four wheeler, had to hard brake to avoid an accident and still ended up with some problems. Many large trucks do not even have a fish eye mirror mounted on their hoods to see what is along their sides. We have found that visibility is improved with hood-mounted mirrors (on both the driver and passenger sides). On our safe driving page, we have a highlighted photo of the 5 mirrors on one of the trucks that my husband Mike drove (which we thought was pretty good at the time). 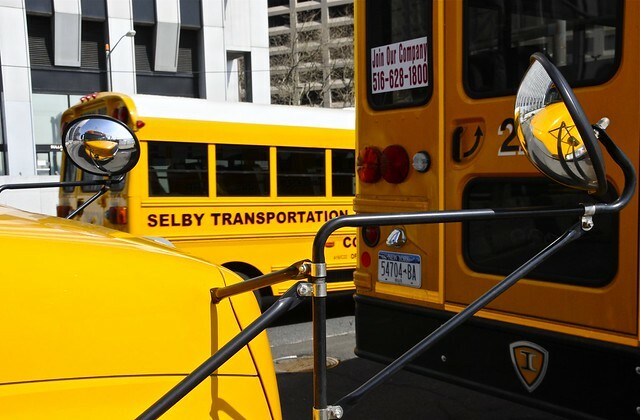 Personally, we have not seen -- although it may exist on trucks -- the type of mirrors that you see on many school buses. 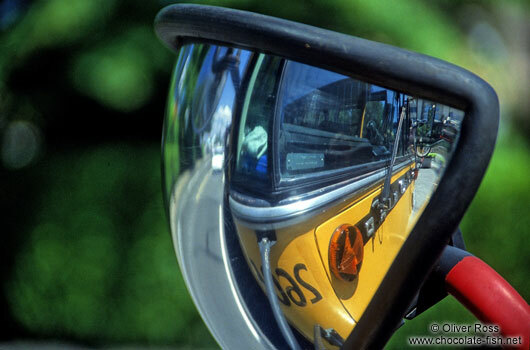 This type of fish eye mirror allows the bus driver to see along the side of the bus and in front of it! 3. bus fish eye mirror 3. * is at a different angle and different distance from the bus. * the addition of a mirror on the front of your truck will naturally lengthen the overall length of your rig. If you proceed with this kind of modification to your truck, please let us know. This may be the start of a trend (if indeed it hasn't started yet) that truck manufacturers incorporate in their truck designs in the future. * the costs of parts and labor you invested. Furthermore, we'd appreciate your opinion about how much better you are able to see around your truck -- especially in front of it. You may do this through the review form part of our truck parts page. Thanks again for your question. I hope that this answer provides some food for thought. Mike and I wish you safe travels and lots of money saving opportunities on the road.